I've been accustomed to taking a backseat role or hiding behind the scenes and taking on a low profile in much of what I do. I've been a musical arranger but been behind the scenes, with our karaoke product in the limelight. I've been webmaster and creator of several websites but been distancing myself from the websites so I don't get associated with them. Last year, I also remember being the official photographer for the prestigious Awit Awards, another behind the scenes role. 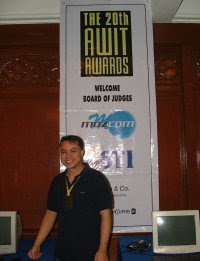 And for the past 2 years, I've been one of the judges for the Awit Awards. Not that I'm not proud of the other projects and positions I've held in the past, but being invited to judge for the Awit Awards is something I'm proud enough to announce rather than be passive about it. It's nice to be considered and acknowledged for having an ear for musical talent, not just by friends or peers but from the very industry that recognizes Original Pilipino Music, that being the Philippine Association of the Recording Industry (PARI). And through the PARI's Awit Awards, the best artists are given due recognition. This year, it's an honor to be judging side by side with the likes of Lito Camo, Christian Bautista, my good friend TBowne from 101.1YES FM, one of my favorite musical arrangers, Jimmy Antiporda and other distinguished judges bringing experience from various aspects of the music industry. It's also interesting to see if my picks win. Check out the article I wrote with the list of nominees, winners for the pre-awarding and a couple of pictures I took from the event.